Welcome to the Grace at Home party! This month I'm writing about taking care of myself body and soul. Today I'm caring for myself by opening my blog to you so that I can see the ways you make your homes places of grace. I don't feel that I've accomplished much over the last few days, but I can celebrate your accomplishments! I can relish the fact that there are people all over the globe who are working hard to make beautiful, gracious homes for themselves and their loved ones. That inspires me! Last week's party included some good food for the soul, too. I was particularly challenged this post from Let Why Lead called "Surprise! I Was a Lousy Wife!" And in this season when we're all so busy, I was really glad to read "10 Practical Ways to Show Love to a Perfect Stranger" by Abby at Chapter 37. Good Morning Richella!! Your #31Days series is such a blessing. And so is having my homespun table setting featured today! Thank you so very much! Wishing YOU An Extraordinary Day!!! 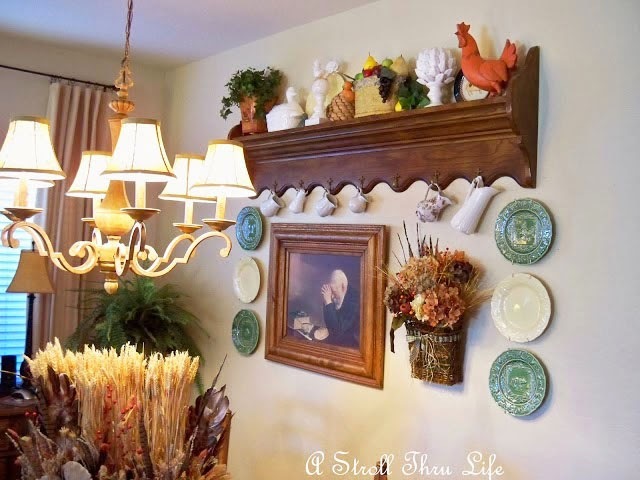 Richella, thanks so much for featuring my dining room...what a nice surprise this morning! Wishing you a blessed weekend!! Thank you for the feature, that was so kind of you! Thanks for hosting, hope you have a great rest of your week! Hi Richella! Thank you so much for the feature! I'm having the same kind of few days as you - not many accomplishments to celebrate, but having this post from last week featured really brightened my day! Have a great (early) weekend! Great features! Thanks for "opening your blog" up to us so we can enjoy this terrific party! Wonderful tables and features! Thank you for hosting this great party dear Richella...I do appreciate it!